A key process value - do your operators have one? Is it easy to monitor? With the AWESOME 1/8 DIN panel meters, featuring big, bright, color-changing displays, keeping track of it is even easier! 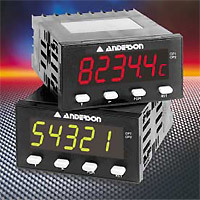 Analog input models for temperature, pressure, level, and flow as well as digital input models such as rate meters, indicators, counters and timers are available. These intelligent units offer multiple relay & alarm outputs, optional serial communication, and specialized functions on analog input units. With 13 models to choose from, the process value you require can surely be displayed. The minimum and maximum values along with total alarm time may be saved until re-set. In fact, your key process value will be displayed on the biggest and brightest 1/8 DIN display in the industry. The AWESOME family features a 0.71" high LED (27% larger than ordinary 1/8 DIN units) with advanced, brilliant red, gallium arsenide technology. Not only is the display large and striking, but it can also change color. The display can be programmed to change from red to green or green to red at a preset value. Easy programming makes these units even more desirable. All models are programmed via the front panel and are scalable to display inputs in engineering units. In addition to showing parameter values on the primary display, a help function can be utilized to show parameter descriptions. The secondary legend also indicates which value is shown on the primary display via a single digit character.